AMC's The Walking Dead is a massive multimedia story line these days, spanning comic books, novels, video games and, of course, the highest-rated series on television. At the epicenter of this sprawling narrative empire is its creator, comic-book writer Robert Kirkman. So fans were understandably excited this week to see Kirkman offer himself up for a Reddit AMA ("Ask Me Anything") session. Many of his comments had implications not just for the comics he continues to write each month, but also for the show and other extensions that remain loyal to his vision. 1. He's not afraid to kill off Rick. Q: Is Rick Grimes a "safe" character? A: Absolutely not. Although when I look in Andrew Lincoln's piercing blue eyes, I feel safe. 2. 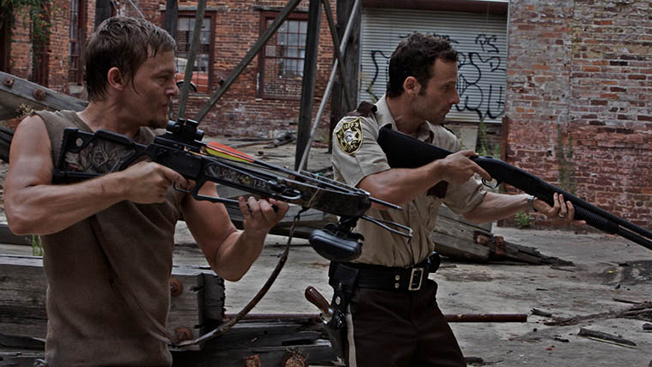 Even Daryl, a popular show-only character played by Norman Reedus, could get killed off. Q: How does popularity, if at all, affect the survival rate of characters? Have you ever killed a character just because they were popular and you wanted to shake things up? Q: How's your relationship with Reedus and the rest of the cast? Does it influence their character's fate? A: It honestly doesn't. Everybody knows the score and everyone knows what they're getting into when they sign on. I think I have a good relationship with all the actors. 3. He supports AMC's decision to fire the first two showrunners but says he was "only on the sidelines." Q: I was wondering if you could speak at all about the circumstances surrounding the trend of multiple showrunners (Frank Darabont, Glen Mazzara, Scott Gimple) and what you thought each of them brought to the show? A: Our showrunner musical-chair routine is not entirely uncommon in television. There have been countless shows that have changed showrunners and some even from season to season. It's unfortunate that this show exists under such a microscope and the behind-the-scenes drama has been pushed into the spotlight … but it's a small price to pay for the success that we've had, so I'll take it. It would be wrong for me to go into any details on the various changeovers because for the most part I was really only on the sidelines during the changes. Although, I will state for the record that I do agree with AMC's decisions in each case and strongly feel they were only acting with the show's best interests in mind. I think Frank [Darabont] set the show up with a solid foundation to build upon and gave us a directing and visual style for the show that we still use because it's superb and has been a big part of what makes us stand apart on television. This show wouldn't exist without him and his work on the pilot still holds up as one of our strongest episodes. We were lucky to have a director of his caliber involved in the show from day one. Glen [Mazzara] was a shot in the arm that the show needed in its second season and his instincts to move story up and really heighten the pace at times was a welcome addition to the show. The level of energy he brought to the show is something we still try to maintain. Personally, Glen was very good to me as a novice television writer and I feel that he was a great teacher whose lessons I still use often on the show. I owe him a lot. Scott Gimple is an absolute rock star. I think that looking back at Season 4 as a whole it is by far our strongest season. The show is intense when it needs to be and slows down and digs into the interpersonal character drama in ways we never achieved without him. Scott's been integral to the show since he came on board for Season 2 and honestly knows more about this world than I do. (And he definitely remembers the ins and outs of the comic book WAY better than me). I think we'll keep him. 4. He hated the CDC episode in Season 1, but not because it was terrible. He felt it gave away too much. Q: Why did you not like the mention about France (being a last human stronghold) at the CDC in Season 1?